This isn’t the first time I’ve fawned over a Pebble smartwatch. During their original Kickstarter campaign, I strongly considered becoming a techno-hipster and strapping that chunky piece of plastic and silicon to my wrist; but since I was barely making ends meet at the time, a smartwatch hardly seemed like the most prudent investment. It’s been almost three years since then, and now Pebble is back on Kickstarter with the Pebble Time and Pebble Time Steel. With a little extra change in my pocket these days and a prediliction for all thing nerdy AND classy, I decided that now was the time for me to join my cyborg brethren and preorder one of these smartwatches. I’ll be honest: I don’t know if a smartwatch is going to magically improve my lifestyle in some unforseen ways or simply act as a neat conversation piece attached to my wrist. The promised functionality – music playback controls, step-counting, email and calendar notifications, etc. – is definitely intriguing, but it’s hard to say how much I’ll actually use any one of the Pebble’s features until I get my unit in July. 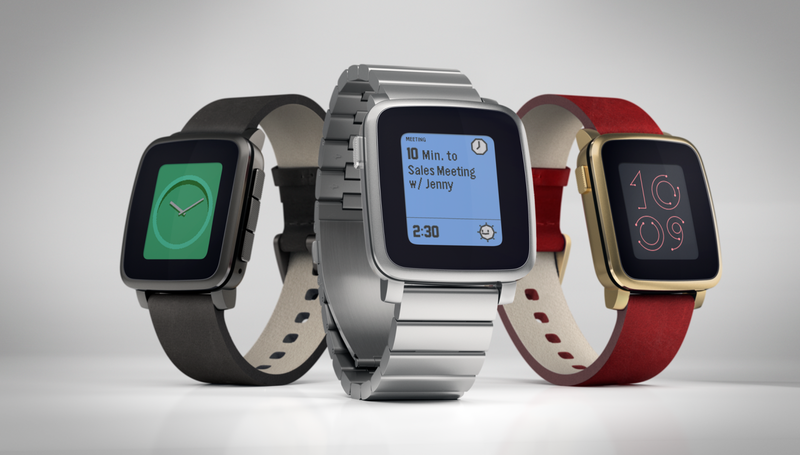 What I do know, however, is that Pebble has made a very attractive watch. I may not be getting mine for another four months, but I’m already starting to pick out extra watch bands. Did you know that there’s a particular NATO watch band associated with James Bond? For a watch that looks like it belongs on a secret agent, I can think of no better compliment.